"Who are they?" "There is something calling them all here…" Screen Media Films has debuted a brand new full-length trailer for the horror film The Void, which is a gnarly throwback to old school horror from the 80s with nasty practical effects, and gross gore galore. The Void is co-directed by Jeremy Gillespie & Steven Kostanski (both from Canadian filmmaking collective Astron-6), and is a mind-bending sci-fi horror thriller about a small town overrun by some "otherworldly threat". The cast includes Aaron Poole, Ellen Wong, Kathleen Munroe, Kenneth Welsh, and Daniel Fathers. We featured two short 30-second teasers last month, and now have a full trailer below to entice horror hounds. I've heard this has some cool scenes, and of course some excellent practical effects, but the rest of it is apparently a mess. Still might be worth a look. You can still watch the first quick teaser trailers for The Void here, for a different look at this horror movie. Encountering a blood-soaked man on a dark deserted road, a police officer rushes the victim to the local hospital. Soon the staff and patients are trapped by a terrifying, otherworldly threat and forced on a hellish voyage into the depths of the building to escape the nightmare. Shocking, haunting and boasting mind-blowing practical special effects. 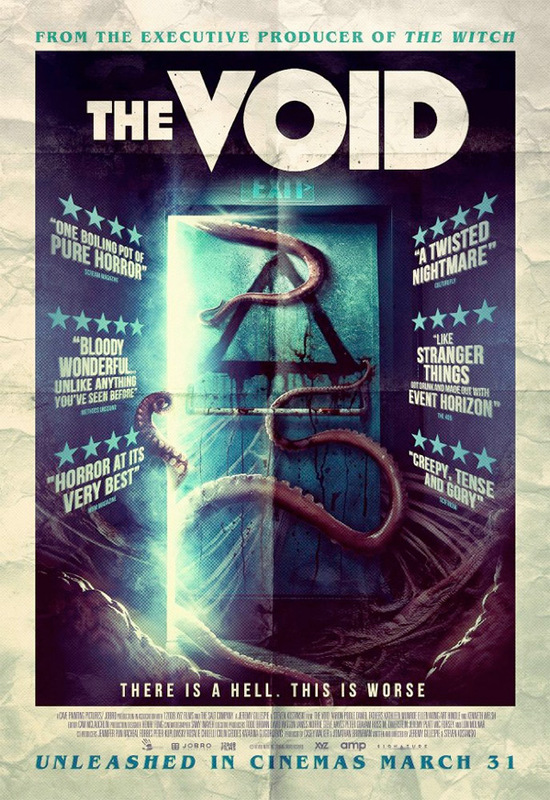 The Void is co-directed and co-written by Jeremy Gillespie (of Father's Day; a former art director) and Steven Kostanski (of Manborg, Bio-Cop), working together for their first time. This first premiered at Fantastic Fest, Toronto After Dark and the London Film Festival last year. The Void opens in UK theaters on March 31st, and in the US starting April 7th this spring. Anyone?